Alaa Salah, “the woman in white”, became the icon of the Sudanese revolution after a photo of her on top of the roof of a car addressing thousands of protesters during a mass sit-in went viral this week. Aged 22, this engineering and architecture student was captured in a traditional white thobe wearing gold earrings with her finger raised to the sky, an image that inspired the Sudanese nation and many other people in the world. 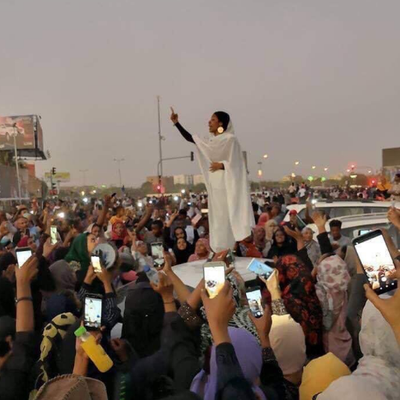 Alaa Salah has chanted ‘Thawra,’ meaning ‘revolution,’ and sang revolutionary songs this week outside the feared Sudanese military and intelligence headquarters, and even outside the Presidential compound.“Women have a voice…it is our revolution,” Salah told them. Bashir has been indicted by the International Criminal Court in The Hague and faces an arrest warrant over allegations of genocide in Sudan’s Darfur region during an insurgency that began in 2003 and led to the death of an estimated 300 000 people.